In recent years, the role of medical affairs within the pharmaceutical industry has been evolving in response to the changing healthcare landscape. The growing emphasis on transparency in decision-making, increasing quantity and accessibility of health-related data, and the expanding role of patients in personal healthcare decision making – are a few examples of the key driving factors underlying the change. Responsible for bridging pharmaceutical development to commercialisation, medical affairs personnel navigating through an increasingly complex healthcare environment need to have an optimal blend of scientific knowledge, communication skills, and business acumen to succeed in their role. Despite the rapid growth of the pharmaceutical industry and an increasing recognition of the importance of the medical affairs function within the region, there are few training programmes specifically designed to develop medical affairs professionals. Clinical expertise and medical knowledge are no longer the main requisites for this role. Targeted training is necessary to help professionals tap into their medical and clinical expertise, while responding quickly and strategically to the ever-changing industry and regulatory trends. To address the competency and development needs arising from this evolving role, the Centre of Regulatory Excellence (CoRE) Duke-NUS and Janssen Asia Pacific, part of the Janssen Pharmaceutical Companies of Johnson & Johnson, have formed the Joint Alliance Duke-NUS Education (JADE), a certificate programme specialising in Medical Affairs. This programme was made possible with the support of an unrestricted educational grant provided by Janssen Asia Pacific. 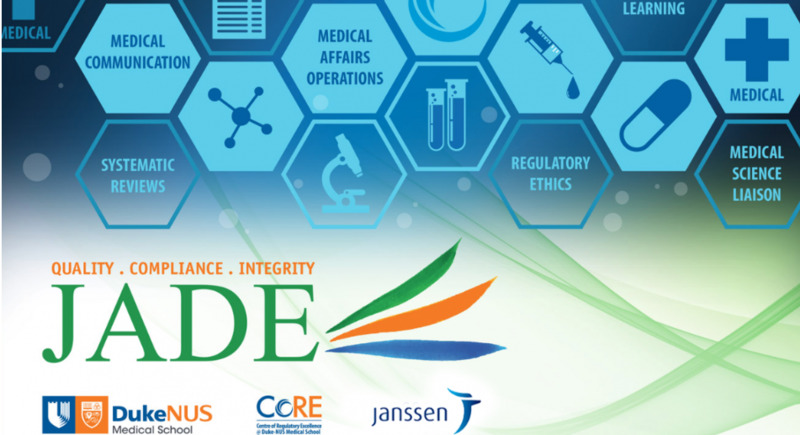 Developed by 48 experts from leading pharmaceutical companies, research institutes, medical communication agencies, clinical resource organisations and universities, JADE aims to build cross-functional skills and capabilities to lead and deliver medical affairs activities and drive change. This programme is designed to suit a wide audience within the healthcare industry including physicians, researchers and health care professionals who are interested in developing their career in medical affairs within the pharmaceutical industry and wish to sharpen their scientific knowledge and business acumen across a number of important areas, in addition to gaining information on the latest industry trends, regulations and operations in medical affairs. A relevant degree in, for example,medicine, pharmacy, pharmacology or life-sciences. At least 2 years of relevant professional experience in medical affairs, clinical research and healthcare.